In order to accommodate the needs of a growing state, the government is undergoing some major infrastructure updates. Following on the success of the past, this year’s event will showcase the current and future state infrastructure plans and projects aimed at tackling the states impending population boom with a record-breaking investment of $87.2 billion. Opening the two-day event will be Jim Betts, Chief Executive Officer of Infrastructure NSW, providing delegates with an in-depth look into the state’s 40-year masterplan. Following Betts will be WSA Co Chief Executive Officer Graham Millet discussing the potential of the impending Western Sydney Airport. Everyone in NSW deserves access to a fast, reliable and dependable public transportation network; returning speaker Tom Gellibrand will be addressing Sydney’s largest public transport project, Sydney Metro, including plans for Sydney Metro West. With a $14.4 billion slated for transport infrastructure, to be invested over four years, the NSW Government has a vision for the future. With the state’s population expected to exceed 12 million people by 2016, NSW’s Future Transport Strategy 2056 will combine transport, technology and innovation to accommodate the growing needs of the area. Activating the potential of regional projects, the Regional Growth Fund will provide funding to regional projects over four years, delivering long-term benefits to the states under-funded areas. The Office of Regional Development will present on the fund’s capability to propel economic growth, increase job opportunities and assist regional communities to capitalise on their strengths. Attracting over 250 delegates and 20 speakers, this event continues to be the states largest major projects and infrastructure conference. Covering important lessons learn from past infrastructure projects to addressing best practice solutions for major current and upcoming projects in the state, this year’s event is sure to be an informative one. 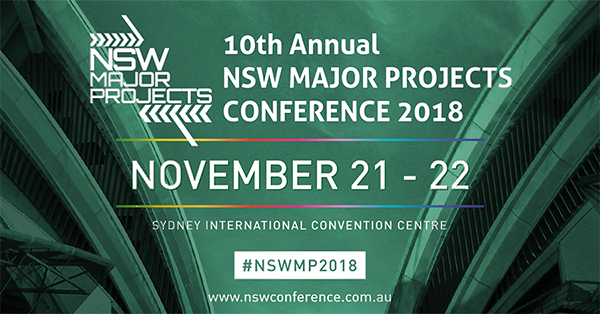 The 10th Annual NSW Major Projects Conference will take place on the 21st & 22nd November 2018 at the Sydney International Convention Centre.